“Trust Me, I’m a Professional”: Defence-in-Depth, King’s College London - Dr. Deane-Peter Baker is a Senior Lecturer in the School of Humanities and Social Sciences at UNSW Canberra, and a Visiting Senior Research Fellow in the Centre for Military Ethics at King’s College London. In this review, he offers a comprehensive treatment of Redefining the Modern Military and highlights the book’s utility in the development of military professionals and the importance of continuing the conversation—even when that means dissenting with the status quo. “Defense.info”: This book addresses the evolution of military professionalism and the role of the military in the liberal democracies over the past two decades. This means that the book really is addressing the question of what the demand side of the land wars in the Middle East and the global war on terrorism means from the standpoint of the judgement of what the military does and what being a competent professional means in this period of history. As great power conflict returns, there is a major shift in what will be expected in order for the professional military needs to do to succeed in deterrence and in case of conflict how to prevail. “Buhle's Bookshelf”: Impressively informed and informative, thoughtful and thought-provoking, accessibly organized and presented. Of special note is the editor's conclusion. "Redefining the Modern Military: The Intersection of Profession and Ethics" is an extraordinary study and one that is unreservedly recommended for community, governmental, college, and university library military science collections. It should be noted for the personal reading lists of military science students, academia, governmental military policy makers, and non-specialist general readers with an interest in…the subject of ethics and the military profession. Major General Mick Ryan’S 2019 Reading List, short list for the Profession of Arms. 9 October 2018, 3pm, Lawrence, KS: Dole Institute - Nathan K. Finney and Tyrell O. Mayfield, editors of the new book Redefining the Modern Military: The Intersection of Profession and Ethics, joined the institute to discuss the importance of re-examining the profession of arms during and between conflicts, as well the impact of modern warfare and social online communications on the military. This was the kick-off book release event for Redefining the Modern Military, and included a book sale and signing with the editors. 6 November 2018, 6pm, Chicago, IL: Pritzker Military Presents Interview and Broadcast - Authors Nathan Finney and Tyrell Mayfield visit the Museum & Library to discuss their book about ethics and professionalism in today's military. Sponsored by United States Naval Institute and GPD Charitable Trust. Midrats on BlogTalkRadio: Ethics, Professionalism, Education & the Military Professional - A military is not an amorphous mass, but a collection of individuals each who can make decisions in their professional role that can have great impact, both positive and negative, well beyond their immediate and personal concerns. Our guests this week to dive in to these and related issues will be Nathan Finney and Tyrell Mayfield. As a base for our discussions, we will touch on subject areas they raised in the upcoming book they are co-editors of “Redefining the Modern Military: The Intersection of Profession and Ethics” published by the U.S. Naval Institute Press. Leaders Huddle Podcast - Ethics are the thing that prevent us from getting in trouble. After a mistake has been made or a rule has been broken, all you are left with is law. Ethics play a key role in keeping us out of trouble and guiding us to make good decisions. Our guests Tyrell Mayfield and Steven Foster discuss this and more. War Room Podcast: Taking Time to Reflect on Military Professionalism - The U.S. military and the militaries of many of its partner nations regard themselves as professional organizations and comrades in the profession of arms. The military is heralded as a profession composed of professionals who enact a unique domain of expert knowledge. But the meaning of this changes over time through the evolution of civil-military relations, global security, and new or emerging threats. The Army underwent a period of reflection at the turn of the century based on its Cold War experiences and renewed its commitment to professionalism. Is the time nigh for another such period? This and other questions are discussed between Ty Mayfield of Strategy Bridge and WAR ROOM’s Podcast Editor Jacqueline E. Whitt. The Dead Prussian Podcast: On the Military as a Profession - In this episode, Mick chats with the Dr Pauline Shanks Kaurin, the Stockdale Chair of Professional Military Ethics at the United States Naval War College. They discuss her chapter in a soon-to-be-released book, Redefining the Modern Military, edited by Nathan K. Finney and Tyrell Mayfield. Pauline discusses the different viewpoints on whether or not the Military is, or should be, considered a profession. The Dead Prussian Podcast: On the Attributes of the Military Professional - In this episode, Mick chats with Dr Rebecca Johnson, the Dean of Academics at the United States Marine Corps University. They discuss her chapter in the soon-to-be-released book, Redefining the Modern Military, edited by Nathan K. Finney and Tyrell Mayfield. Rebecca discusses the attributes of a Military professional, the profession, and the client, considered a profession. The New Book Network Podcast - Editor Nathan Finney and contributor Brian Laslie discuss the effort that lead to the publication of Redefining the Modern Military and the importance of the book at this point in history. Contributors examine philosophical and legal questions about what constitutes a profession, the requirements of a military professional, and military education. Additionally, the authors tackle questions of ethics related to new technological advancements, such as unmanned aircraft. Finally, an interesting discussion of the military’s relationship with society, and vice versa, is discussed as an important component of oversight of the profession. Today I spoke with Finney and one of the contributors, Brian Laslie. The Dead Prussian Podcast: On Laws, Ethics and Professionals - In this episode, Mick chats with Wing Commander Jo Brick, a Royal Australian Air Force legal officer and editor at Central Blue. They discuss her chapter in the book, Redefining the Modern Military, edited by Nathan K. Finney and Tyrell Mayfield. Jo discusses the legal and ethical considerations of the modern military profession. At 1-year mark, College of Leadership and Ethics officials talk about teaching officers how to lead – plus what they are reading. In April 2018, a directive from the top of the Navy launched a new academic department at U.S. Naval War College. The College of Leadership and Ethics was created to provide a new home for an expanding Navy leadership curriculum. Dean Peg Klein and associate professor Gene Andersen sat down recently to talk about the accomplishments of the first year, what’s coming next and what Navy leaders should be thinking about and reading. This Richland man is a combat veteran and mountaineer. Now he’s an author, too, by Sara Schilling of the Tri-City Herald. A few years back, Casey Landru did a brave but potentially headache-inducing thing — he jumped into a discussion on social media. The question was, “Is the military a profession? What does that mean to you? What are the ethical responsibilities of modern military members, if any?” Landru gave his thoughts, and so did several others. Somehow, the days-long discussion didn’t go the way so many do — devolving into a mess of memes and trolling. Instead, it was measured, intelligent and respectful. #ResearchNote – Redefining the Modern Military: An Airman’s Perspective, by Dr. Brian Laslie - In this Research Note, Assistant Editor, Dr. Brian Laslie reflects on his contribution to a new volume about military professionalism entitled Redefining the Modern Military: The Intersection of Profession and Ethics that has been edited by Ty Mayfield and Nathan Finney and published by Naval Institute Press. What Does It Mean to be a Military Professional? by Drs. Tony Ingesson and Ray Kimball - Over fifty years have passed since the seminal texts that fundamentally changed the conversation on professional Western militaries were written. Samuel P. Huntington’s The Soldier and the State, Morris Janowitz’s The Professional Soldier, and Sir John Hackett’s Profession of Arms quickly became benchmark publications that framed the discussion of the military as a profession, their place in Western societies, and modes of civil-military relations. These texts emerged during the brief window between the Korean and Vietnam Wars—the last two wars that America would fight with conscripted forces—a critical and opportune time for the American military. DODReads.com Author Interview: Redefining the Modern Military by Dr. Simon Anglim, Steven Foster, Dr. Ray Kimball, and Dr. Brian Laslie - Our post this week comes from the book Redefining the Modern Military: The Intersection of Profession and Ethics. This edited collection examines the changing character of military professionalism and the role of ethics in the 21st-century military. The authors, who range from uniformed military to academics to non-uniformed professionals on the battlefield, delve into whether the concepts of Samuel Huntington, Morris Janowitz, and Sir John Hackett still apply, how training and continuing education play a role in defining a profession, and if a universal code of ethics is required for the military as a profession. Redefining the Modern Military puts a significant emphasis on individual agency for military professionalism as opposed to broad organizational or cultural change. A New Foundation for the Profession of Arms, The Military Leader - Try to visualize the nature of today’s profession of arms and it’s not a stretch to envision a ship tossed around violently in storm waves. Social media. Political turbulence. The Millennial Generation. Fewer combat deployments. Civil-military fissures. These facets of our socio-political life shape and often erode the essence of what it means to be a military professional. The profession of arms needs a little clarity. That’s why I am excited to share a timely new book by two of my friends and colleagues, Nate Finney and Ty Mayfield. 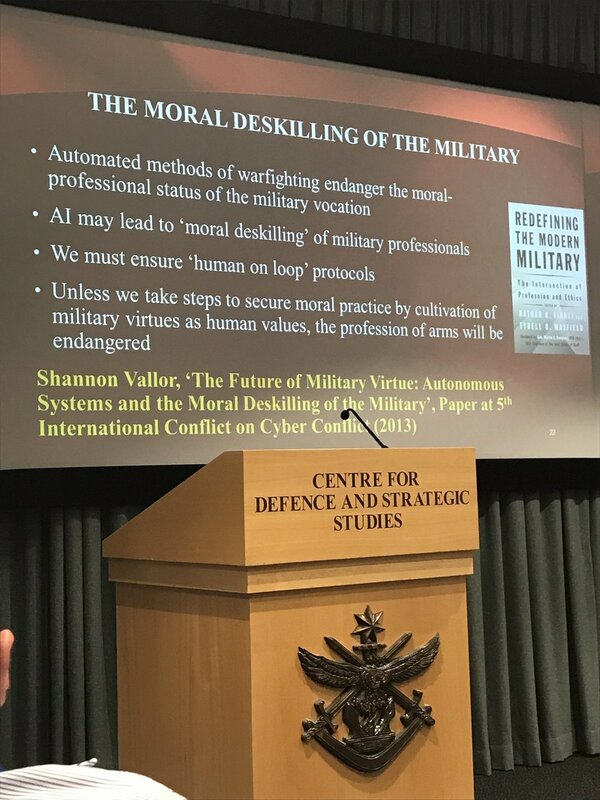 In Redefining the Modern Military: The Intersection of Profession and Ethics, they do a wonderful job of bringing context to the clouded notion of today’s professional military service.